What would it take to break Washington, Oregon, and California off of the CONUS and move them between Hawaii and New Zealand? I think you would need a 'Dillon-Wagoner Graviton Polarity Generator', also known as the 'Spindizzy'. Some nukes and Lex Luthor? New question: Can we impeach him now? I was thinking about the whole terraformed Mars thing, because of a dream I had this morning, and I began to wonder about the common presumption. The common presumption is that terraformed Mars stereotypically assumes 1 atm of air with standard Earth composition. And my dream this morning reminded me of the Earthlike atmospheres thread. Looking at it again, we all know by now that 0.21 bars of 100% can be breathable. So, lets apply that to Mars. We dont have the tech to add oceans, plain and simple. But, do we have the tech *today* to give mars 0.21 bars of at least 95% oxygen? How much co2 does mars have in its air do we need to compensate for? If we do have the tech, what is it? If were don't have it, what do we need to do to get it? And it won't be easy for sure, but how hard will all this be? PlutonianEmpire, Well no matter how hard it is to get the oxygen there, it will be even harder to protect it. Mars has no magnetic field so the atmosphere it has will just be ripped away by the solar wind. That may actually not be as big of a problem as you think. There are many ways in which gases escape a planet's atmosphere. The one you're referring to is 'sputtering', where gas molecules get ejected due to collisions with solar wind particles, which a magnetic field protects against. However, this process is fairly slow -- it's important over million to billion year timescales. Assuming we can build a breathable atmosphere on century to millennia timescales, then that loss would be easy to manage. There is also atmospheric loss by 'evaporation' (fastest molecules escaping), and there can even be atmosphere blown off of the planet by large impacts. All of these processes were important for the loss of Mars' atmosphere early in its history. It's a cool idea. One interesting effect would be the reduced boiling point of water on the surface -- about 60°C. Barely hot enough to cook an egg, after boiling it for at least 20 minutes. How much co2 does mars have in its air do we need to compensate for? Mars' surface pressure is variable, especially by altitude, but let's take 11.5mbar at the lowest elevations. At 95.9% CO2, that's a partial pressure of about 0.011atm. This is like having 1% or 10,000ppm CO2 at Earth's atmospheric pressure. If we kept this with the additional 0.21atm of oxygen, then it would cause some drowsiness and long-term CO2 adaptation. Interesting. I took my SolarSysTPE file and calculated a new composition from that which ended up as the following for 0.21 atm for Mars: 94.3% Oxygen, 5.484% CO2, 0.11% Argon, 0.108 N2, and 0.00318%/31.8 ppm of CO. Depending on ground or soil conditions, how beneficial might this be for Earth plants? 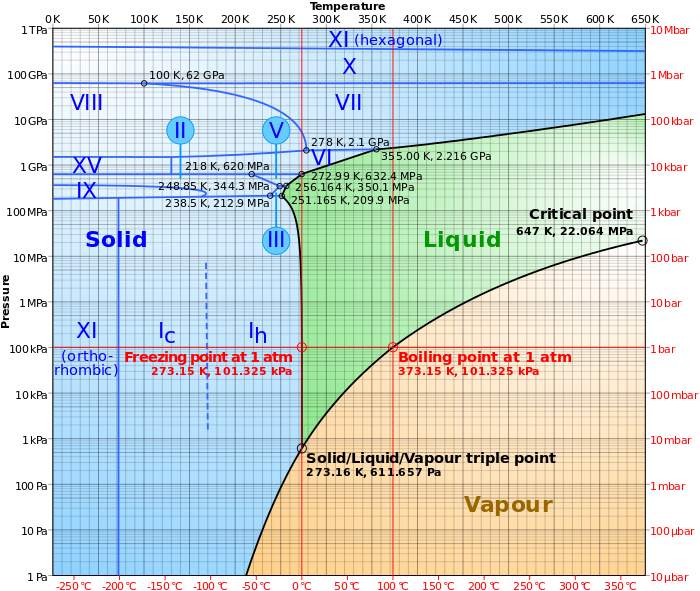 Also, how do I calculate the freezing and boiling points for water for different atm pressures? You've got options. If you like, you can eyeball it from a phase diagram, or you can use an online calculator like this one. This is for the boiling point. For the freezing point, it's a good approximation to say that it's constant through the pressure range you're probably interested in. It's 273.16K at the triple point, and 273.15K at 1atm. So you should be in good shape. As for the effect on plants, I don't know of an answer offhand. We're combining two effects: higher CO2 partial pressure and lower total pressure. We could draw upon some studies on the effect of each of these things on plants, but I'm not sure about both of them together. Last week during my physics tutoring I was asked a neat question. It has to do more with chemistry than physics, but the premise of the question is very interesting, and so is the answer (or at least I think so anyway). I thought I would ask the question here for you all to think about. If you take pure water (doesn't have to be pure, but it helps), and cool it down very slowly in a calm setting, it is possible to bring it below 0°C without it freezing. This is known as supercooling. In fact, you can bring it pretty far below its usual freezing point -- down to its "crystal homogeneous nucleation temperature" of -48.3C. Then, if you disturb it, such as by giving it a good whack or introducing a seed crystal, it will freeze very rapidly -- within seconds! There are some good demonstrations of this on youtube. You can also try it yourself by leaving bottled water outside when it's below freezing for a few hours, or in a freezer if it is not subject to vibration or cooling too quickly. This is all pretty cool (puns), but a curious thing which I was asked about is why, when supercooled water freezes, it does not freeze completely solid? There is always some liquid water left over. So if you're interested, think about it, and try to reason out an explanation for this fact. The amount of the water which ends up frozen depends on how far below 0°C it was when the freezing process started. See if you can calculate the fraction (or percentage) of the water which ends up as ice, if the water was supercooled to -10°C. What does your answer tell you about the structure of the ice that is being formed? It's worth noting that there are some subtle facts which could change your answer or make it difficult to find. Feel free to make and state any simplifying assumptions. At what temperature must the water must be supercooled to, in order for it to freeze completely solid when disturbed? (This will be a theoretical answer, because it will be below -48.3C, which the water can't be supercooled below since at that point it freezes anyway). Well, that'd be a fairly easy answer since I remember something about states of matter from school physics course. Freezing is an exothermic process. Which means that when the supercooled water freezes, excess of the energy, released in this process, will be diverted to outer bounds of water, I presume. The amount of heat released in the process of freezing should be less then it is needed to heat up all the water above melting point. Heat capacity of water at this temperature is about 4 kJ/kg and enthalpy of fusion is 335 kJ/kg, so it is roughly -84C. We both model this as a release of latent heat energy through the phase transition. Where we are different is in describing what that heat energy then does. In your model, this heat is used to raise the temperature of the still-liquid water to 0C, and then the ice forms -- so the ice is already at 0C. From this you conclude that to freeze the water completely, the initial temperature must be the ratio of the latent heat of fusion to the specific heat of liquid water. My modelling choice was to have the water freeze, release latent heat during that process, and have that heat raise the temperature of both the newly formed ice and the surrounding yet-to-be-frozen water to 0C. In other words I don't have the ice already at 0C when it forms -- it is still supercooled and 'consumes' some of that latent heat to warm to 0C. The excess latent heat raises the temperature of the remaining liquid water. From that I conclude for the water to freeze completely, it is the ratio of the latent heat to specific heat of ice, which gives a temperature in the realm of -170C (varies a bit since the specific heat of ice is temperature dependent). There is a question of how quickly the heat can be transferred through the ice and through the water while the freezing front spreads through it, and in reality the heat is probably confined close to the "freezing front". Modelling that is incredibly hard, so instead I just consider the 'end state', where the freezing process has completed, but before there has been time for appreciable heat to transfer to or from the environment. (We both implicitly assume this and I think it's reasonable, since the whole process is very fast). So, I don't make claim as to which one of us is closer to reality. It could even be somewhere in between. Both of our models are pretty simple, and what really happens is quite complex. And the take-away is that, in any case, it is remarkable just how much heat energy is actually being released when water freezes, and we don't normally notice it since we are used to it freezing slowly. Yeah, well, I did not consider this possibility and it was a bit of blind guess still. Now let me rationalize it further - we have 2 conditions, one of which is supercooled water at certain temperature and the other one is partially frozen water at 0C. The process of freezing brings us from condition to condition, while thermodynamic system remains relatively closed. That means, the energy can not be released outside or absorbed, therefore, naturally, there's only one way I can imagine it - all released enthalpy must be spent on heating water ...and ice mix. Ok, I see now. So we actually heat both water and ice, and as we proceed with multiple experiments, the amount of water is reduced and amount of ice increasing, until there's 100% ice that shall be heated up to 0C - this is our required extreme case. Which means that we need to heat it all the way, which indeed results in a temperature about 2 times lower. I think you quite got it. And here's how we can work it out for the general case, where it doesn't freeze completely and we want to know what is the fraction which is frozen as a function of the initial temperature. Suppose some mass ∆mi of the water turns to ice. This releases heat ∆Q=∆mi*L, where L is the enthalpy of fusion for water. The m's cancel, as we might expect since the fraction which freezes should not depend on the total mass. We can also say that since the freezing process must end with the water and ice in equilibrium at 0°C, that ∆T is the same for both water and ice and that it equals 0C minus the initial temperature T0, or just -T0. Finally, since the initial fraction which is frozen is zero, ∆f is just f.
This tells us that if we freeze water which was supercooled to -10C, that only about 12% of it is actually ice! This is very surprising, since we see that the freezing front spreads through the entire mass of water, and visually it looks like rather solid ice. Indeed, if we freeze a bottle of water like this and then turn it upside down, some water does pour out, but only a fairly small amount -- less than half of the total volume. It seems like the ice must make up a lot more than 12%. But what's actually happening is that the ice which is being formed is very diffuse -- "dendritic ice". It forms very quickly and has an irregular, thin-plate structure, which locks in a lot of liquid water. There's a way to see this, too. If we let the ice-water mix warm up at room temperature, the ice will break up into many thin plates before it melts completely. Another way to tell is by how long it takes for it to melt -- much less time than for a solid ice block. So this is an interesting case in physics where we arrive at an answer which seems absurd, yet is actually correct (or pretty close to it). It's a case where we should trust the mathematics more than our initial observation. what is the Rydberg molecule?